Charged with Tomorite tomato food. With seaweed extract. 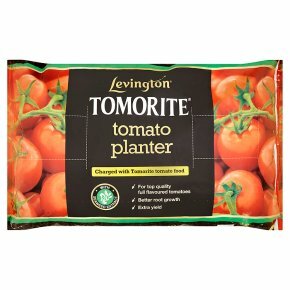 For top quality full flavoured tomatoes. Better root growth. Extra yield. Trusted by generations of tomato growers. Planting Shake the bag to distribute the contents. Cut out panels along dotted lines. Delay planting tomatoes until the first flowers open. Watering After planting, water in using about 4.5 litres (1 gallon) and then water as necessary to keep the bag moist. This planter requires less frequent watering than smaller grow bags. Feeding We recommend feeding 20ml of Levington® Tomorite® in 4.5 litres (1 gallon) of water. Use 4.5 litres of diluted Levington® Tomorite® for most crops, use once a week for heavy feeders such as tomatoes under glass. Growing Tips Avoid piercing the bottom of the bag to retain water. Train plants to fan out so that they receive maximum light and air. For best results feed with Levington® Tomorite®. Crop: Tomatoes - under glass, Plants Per Bag: 2, Start Feeding When: The fruit on first truss is pea sized Crop: Tomatoes - outdoor, Plants Per Bag: 2, Start Feeding When: The fruit on second truss is pea sized Crop: Peppers & Aubergines, Plants Per Bag: 2, Start Feeding When: The fruit is the size of a golf ball Crop: Melons, Plants Per Bag: 1, Start Feeding When: The first fruit is swelling Crop: Courgette/Marrows/Cucumbers, Plants Per Bag: 1, Start Feeding When: Picking commences Health and Safety Advice Use in a well ventilated place and avoid breathing in dust. Always wear gloves when gardening and then wash hands after use.